MOTORSPORT: Shane van Gisbergen overcame a horror start to the Sydney 500 to claim a vital third place in Saturday's 250km race on the streets of Sydney and secure a maiden Supercars drivers championship. The Kiwi dropped five spots from pole position at the first corner and then all the way to the back of the field after getting hit with a pit lane penalty for spinning Mark Winterbottom. But a smart strategy, fast car and timely safety car intervention allowed the Red Bull Racing driver back into the game and he capitalised on fresher tyres during the closing stages of the race to make some key passing moves to collect enough points to take an unassailable lead in the title race ahead of today's finale. 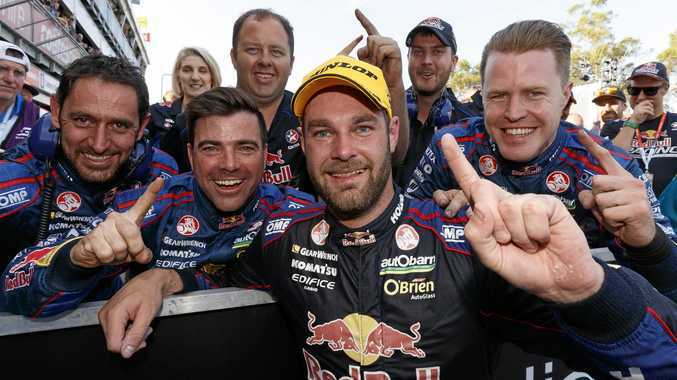 Teammate and title rival Jamie Whincup eased to victory but van Gisbergen did enough to ensure he became the third New Zealander and first since Jim Richards in 1991 to win the championship. A delighted van Gisbergen admitted he did it the hard way. 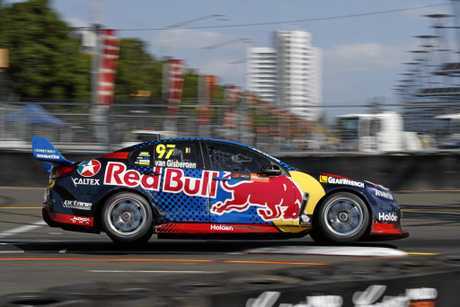 "Pretty amazing feeling," van Gisbergen said after the race. "Sorry to Mark [Winterbottom] - I went up the inside and just didn't commit. It was his right to turn in there and my fault. "Awesome car and to come through like that - lucky safety car - but good racing. "It has been an amazing year. "I just want to do a burnout but we will do that tomorrow." Whincup, who had trailed his Red Bull teammate by 190 points going into the round, did all he could but conceded the task was just too big. "We gave it all we could like we have done all year," the already six-time series champion said. "Big congratulations to Shane and all the #97 crew. The winner of the championship is the most consistent and they have been the most consistent. "Not quite our year but I hope everyone enjoyed the battle." The Holden Racing Team duo of Garth Tander and James Courtney collected second and fifth respectively in what will be the team's final round with Holden factory backing. New Zealander Scott McLaughlin finished fourth in his Volvo in his final round with the GRM Team as he jumped Craig Lowndes for third place in the championship. Starting from pole van Gisbergen made a terrible start to the race and was swamped by Whincup off the line and then by the chasing pack at the first corner. He dropped to sixth place but settled down and found some rhythm after that. But just as he looked to be working on getting into an all-important top five spot he couldn't quite make a successful move on defending champ Winterbottom and spun the Ford driver around. The Kiwi was handed a pit lane penalty as a result that dropped him to the back of the field. Today's last race of the season will take place over 250km in the final race on the streets of Sydney with the series ending in Newcastle in 2017. The only championship battle still up for grabs is for third place with McLaughlin holding a narrow nine point lead over Lowndes.